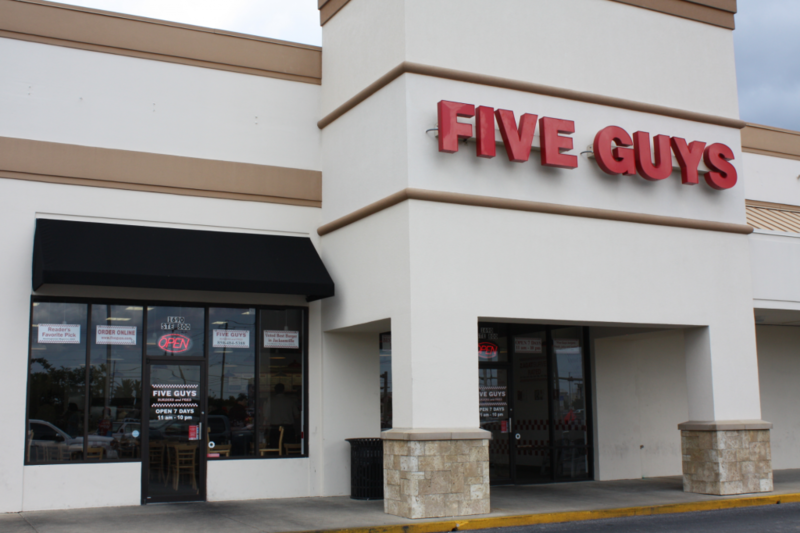 Five Guys Burgers and Fries is an American hamburger chain with a location on the corner of Airport and 9th Ave.
More than one follower asked us this week “Why are you going to Five Guys! ?” with a look of disgust. We get it, Five Guys is a chain restaurant- but with over a thousand franchise locations nationwide- they must be doing something right. Besides, any restaurant that’s making burgers and nothing else, deserves an opportunity to show their stuff. The friendly staff at Five Guys create a hamburger assembly line that’s fascinating to watch. Well organized, efficient and energetic- there’s something hypnotic about watching the folks at FGBF make your burger. But as you know, we’re only concerned with one thing; TASTE. Let’s start with the bun; the poppy seed bun is soft and delicious. Perfect in size, the bun is substantial enough to keep your fingers from sinking into delicious beef- but not too big. There are a lot of fancy toppings available at FGBF, but as always- we stick to the basics (lettuce, tomato, onion, pickle.) The produce is above average and features a slice of perfectly ripened tomato, diced onion, a crispy leaf of iceberg lettuce and ordinary dill pickle chips. The condiments were applied generously which had a few judges scraping excess mustard off their burger. But, no harm done. Someone in the kitchen just got carried away with the yellow squirt bottle. The standard burger at FGBF includes two patties- and we weren’t complaining. It made for just the right amount of beef in every bite. The patties were cooked perfectly- juicy and hot with delicious melted American cheese on top. 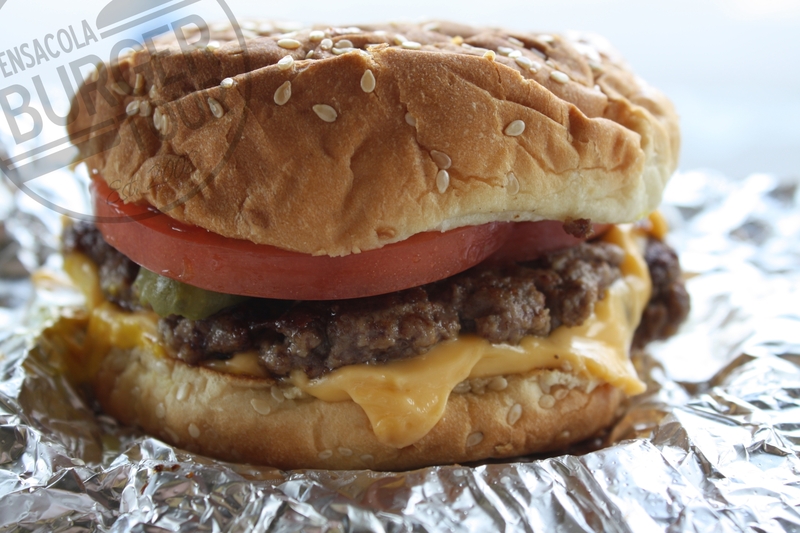 Five Guys is a “fast casual” dining experience, not fast food. Our judges agree their burgers are hands down better than what you’d find at a fast food chain. The Five Guys burger finished with a final score of 7.31 which is good enough to land it in our top spot (for now) but we’re not ready to crown it Best in Pensacola this early in the competition.